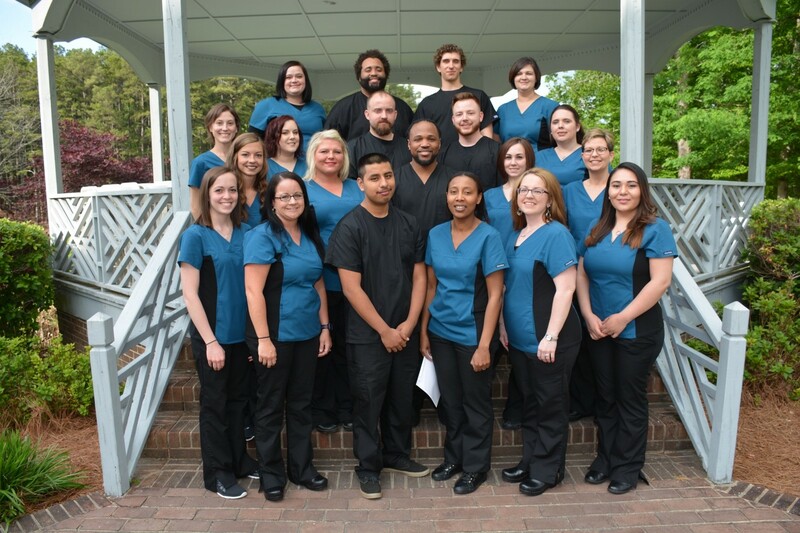 The Radiography Class of 2018 included James D. Bolton of Henderson, Marco Antonio Carmen-Vazquez of Oxford, Yamile Chavarin of Henderson, Whitney Michelle Cox of Oxford, Crystal Gill of Henderson, Brittany Harmon of Norlina, Gloria Maria Hudnall of Oxford, Corinna W. Hutton of Durham, Jan Maniace of Hillsborough, Aaron McNeill of Oxford, Mark James Meinhart of Louisburg, Bethany Scarbrough Murphy of Youngsville, Laurie Newton of Henderson, Brittnee M. Orto of Creedmoor, Ashley Rhew of Timberlake, Katie Weary of Bullock, Terrance Mario Wesley of Raleigh, Lori Faye Wiggins of Creedmoor, Johnathan Williamson II of Oxford, and Jennifer Wright of Hurdle Mills. Keynote speaker, John Douglas Britton II, who is a vascular interventional technologist at the Veterans Administration Hospital in Durham. Britton was chosen by the graduating students to receive the Joint Review Committee on Education in Radiologic Technology (JRCERT) Certificate of Excellence for Clinical Educators, presented at the ceremony by Stacey Soles, VGCC’s clinical coordinator for Radiography. Receiving the JRCERT Certificate of Excellence for Students was Aaron McNeill, with the award presented by instructor Lewis Daughtry, Jr. A special recognition was also made to McNeill by Soles for perfect attendance in the clinical education classes during the entire 21 months of the program. Among other awards presented, the VGCC Radiography Academic Award was given to Ashley Rhew, and the VGCC Radiography Clinical Excellence Award was presented to Terrance Mario Wesley. Those presentations were made by Angela Thomas, VGCC’s dean of Health Sciences. The students voted for Tabitha Owens of EmergeOrtho as the top technologist at the clinical sites in which they received their 900 hours of practical training, while the Clinical Affiliate Award of Excellence went to the Granville Medical Center Radiography Department. Both awards were presented by instructor Anthony Twisdale. Dr. Brown shared some information about the diverse class, noting that nine of the 20 graduates had been raising children during their studies and 12 had earned Dean’s List or President’s List honors. Seven have already accepted employment opportunities in their new careers, and 10 of them have been accepted into educational programs to diversify their skill set within Radiography, including CT, MRI, nuclear medicine and radiation therapy. Others have plans to concurrently take classes to obtain their bachelor’s degree at four-year institutions. As class representative, Terrance Mario Wesley spoke on behalf of his classmates. He shared comments about each of his fellow graduates and his program instructors and clinical instructors. Describing his instructors as being “the best a student could ask for,” he added, “I would like to thank you all for imparting wisdom, believing in us, and being an awesome example for us.” Wesley said. He closed with a quote from his childhood mentor as encouragement to graduates and the next class of radiographers: “Good, better, best — never let it rest until your good is your better and your better is your best.” Wesley also gave the invocation and benediction. Daughtry shared the history of the Radiographer’s Pin prior to Thomas and Twisdale awarding pins to each graduate. Thomas led the graduates in reciting the Radiographer’s Pledge as the ceremonies concluded. A Flickr album of photographs from the pinning ceremony is available at https://www.flickr.com/photos/vancegranvillecc/albums/72157696458718574.